Olympia SURJ members after speaking about anti-racism at a right-wing rally. On March 5th, Anne Braden Program Alum Sarah Stockholm spoke at the counter-demonstration against militia groups at the capital building in Olympia, Washington. Here is her story of organizing toward collective liberation in a context of white supremacy and extremism. As debates about the role of poor and working class white people in the election gain traction, we wanted to share with you Sarah’s experience and remember what it is we are building and fighting towards. “In March, on a day of coordinated far-Right national actions seeking vengeance for state violence, I stepped out of a crowd of primarily white ranchers, Libertarians and members of militia groups including the Three-Percenters and Oath-Keepers who had gathered on the Olympia, WA capitol grounds. I put flowers at the memorial of LaVoy Finicum – the white rancher killed by law enforcement at the end of the armed occupation of the National Malheur Wildlife Refuge in Oregon– and took the microphone. 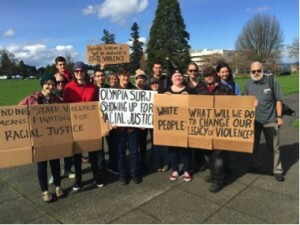 Scattered in the crowd were almost 20 white people from Olympia’s Showing Up For Racial Justice (SURJ) chapter network. We were there because challenging white supremacy involves taking action and organizing other white people. We understand that if we don’t share our values rooted in anti-racism, the entwined narratives of white supremacy, radical Right-wing ideology and vigilante violence remain the loudest. It was a question centered in my fierce belief that all people hold the possibility of transformation, of radical questioning and action. Rural, white working class communities are too often pitted against communities of color in a “divide and conquer” approach. In turn, I often see white urban middle-class Leftists position themselves against rural white working class communities. This narrative of ‘good whites’ versus ‘bad whites’ will never build a multi-class, multi-racial mass movement for racial and economic justice. This action asked me to examine which white people I find myself organizing and why. I grew up in rural South Dakota – occupied Lakota Territories – cattle country. Now, I live in a small progressive city where I can spend almost all of my time around other white people who speak my political language and are active in social movements. Don’t get me wrong; it’s a real joy to work alongside these community members. However, this action was about intervention – it was about speaking to the underlying values of a far more conservative white base, and asking them to join a struggle for collective liberation. As I spoke about past and current struggles for self-determination, multi-racial/multi-class movements, state and corporate violence, strangers nodded in agreement. In that moment, I felt the most important thing I could do as a white person was speak to the white people who almost always hear from the Right, but rarely from the Left. Perhaps the most telling moment was when State troopers stepped between SURJ members and rally attendees. Their action revealed the threat posed by dialogue, relationship building and alternative narratives. After many one-on-one conversations, I think we did seed some important questions in many peoples’ minds that undermined the event’s dominant narrative. Think about it this way. The Vietnamese resistance to colonization and fight for self-determination was supported by a multi-racial anti-war movement that asked American civilians and GIs to defect from the entwined narratives of U.S. imperialism, militarism and white supremacy. Such an international political transformation brought the end of the American War, aka the Vietnam War. Just imagine if in our organizing we directly asked more white people to defect from the narrative of white supremacy and join the movements that have been fighting white supremacy for hundreds of years? I imagine we could see the end of white supremacy. Sarah Stockholm is an Anne Braden Program Alum ’13 and an organizer with the Olympia SURJ chapter, Art Forces and a Theatre of the Oppressed practitioner.